I think you can't go to England unless and until you brush up on your Jane Austen. Hence, I picked up Persuasion as I honestly can't remember when the last time was that I read it. It's entirely possible that I have never read it, although I do feel quite certain that I watched the BBC production. Alas, our visit to England does not involve a visit to the Lake District for the simple reason that we lack the time. If we wish to see that, we'll have to go back again. (I have no objections to this idea.) Picking and choosing the places we most wanted to visit, I think you could consider our upcoming travels to be more history based than literary. Still, I maintain that you really can't consider a trip to England without reading some Austen. Persuasion was a delightful read. I say that not being a devoted Austen fan. I tend to leave wide gaps between my Austen books but having just finished Persuasion I'm not totally sure why that is. My last read was Emma back in 2012. Three years! Mildly ridiculous. However it was a happy accident than I picked Persuasion without realizing that this was the novel that Austen wrote on the heels of completing Emma. 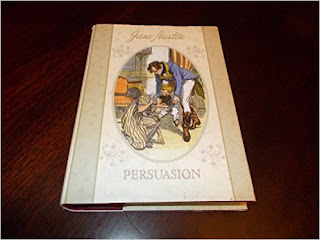 Persuasion is also Austen's final, completed novel to write (but hopefully not mine to read). Anne Elliot of Kellynch Hall is the main female character in this novel. She is 27 years old, unmarried and unloved by her widowed father or either of her ridiculous sisters. She has but one friend, a Lady Russell who was friends with Anne's deceased mother. Although Lady Russell might mean well, she had previously persuaded a 19-year old Anne to break off an engagement with the man she loved, Frederick Wentworth. At the time, Wentworth had no name and no connections. Lady Russell did not think him a suitable match. In his distress over the broken relationship and his determination to prove Lady Russell wrong, he went out into the world to seek his fortune and found it. Now these many years have passed and circumstances bring Anne and Frederick into the same society again and there is great tension over whether or not they will end up together again. This is Austen though which makes it entirely predictable. The joy is in Austen's ability to turn a phrase and fill her stories with deep emotion and great hilarity. She is altogether charming and reading her books are such a pleasure. Not that I'm the world's greatst advocate for reading Austen, seeing that I leave such large gaps between my reads, but if you haven't read an Austen then do try one! Any will do. They are each fun in their own way. I'm glad to have spent some time with Austen again and I'm also glad to know that there are several additional titles that I still have to look forward to re-reading. Whenever I read Persuasion, I immediately declare it to be my favorite Austen book - and then I promptly forget most of it. That way, every time I read it, it becomes my favorite Austen again as I see it with fresh eyes. This is my favorite of Austen's novels. I didn't like P&P or S&S at all the first times through, but gradually came to love them. But Persuasion I loved from the outset. The film with Amanda Root and Ciarin Hinds is very good. As I've gotten older, Persuasion has become my favorite Austen novel. I love them all, and I can't say that the main characters are my favorites (That would be Emma's Mr. Knightly & Pride & Prejudice's Lizzy), but the story resonates with me. Although I haven't read any Austen books (did I just get myself kicked off, for admitting that?) I've watched multiple BBC film adaptations of all of them, and this is my favorite of all her stories. The version with Sally Hawkins and Rupert Penry-Jones? PERFECTION. I'm hoping to read this later this year. I should re-read Austen. It's been a long time, too long, since I've read any of them. I thoroughly enjoyed each one of them, but it took some "getting into" her round about way of writing*. People had more time to sit and talk, and listen, and read then, I suppose. *Except for Pride and Prejudice. I was caught by the first paragraph, by Mr. Bennett and his wife and daughters. Hilarious! 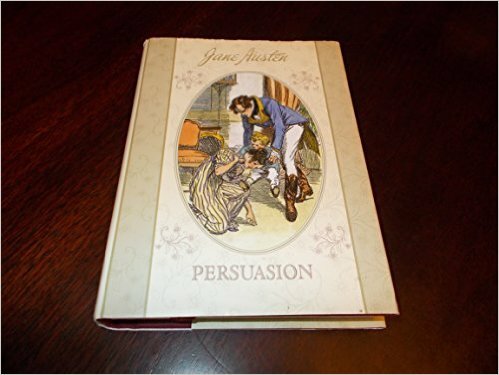 In college, I was first attracted to John when he mentioned that not only had he read every Jane Austen book, his favorite was Persuasion. It is my favorite too.